Well, when you are on a prog-related page and reviewing an album made by a hard rock band in the peak of their commercial success, you ought to know it won't be too proggy. :P So, if you approach this album with reasonable expectations, you will be pleasantly surprised for there is very strong material on here. As paolo noted, this is actually better than Agents of Fortune as here, the transition to a softer and more accessible sound is complete and the band sounds more assured. 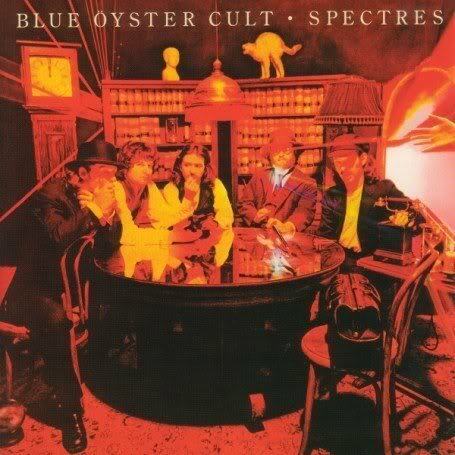 The result is THE alltime best Blue Oyster Cult song - I love the night, better than even Astronomy, I say. Yes, it's a very radio-friendly ballad, but I am sure many highly revered prog exponents would love to have written such a simple but haunting creation of music. What's more, it is sandwiched between the other two best tracks of the album - Going through the motions and Nosferatu. Top this off with the radio hit Godzilla and Death Valley Nights, you really have some of the Cult's best material on a platter. Unfortunately, Spectres is a flawed masterpiece and where it falters is in losing momentum from Searching for Celine through to Celestial the Queen. This clutch of four tracks is merely decent and does nothing to keep you interested. And, the golden rule of mainstream rock, never load all your best material at the front or the back, which is precisely what BOC end up doing here, leaving the middle rather thin and unsatisfying. Another thing I must note is the vocals are frequently weak, even going offkey repeatedly, in this album, which is surprising, considering how strongly I Love the night is rendered. All in all, if you don't exactly expect Abbey Road to sound like Brain Salad Surgery, this should be just fine...very accessible, very much rock-based, but still very good.